Follow along here to use your Drip Campaign feature to create a completely automated Welcome Email, that will send to anyone who signs up through your web form. Exciting! This is in your Audience area. Just click on the “Audience” tab, and then on the grey “Add a list” button. Call the list whatever you like, but make sure it’s something you’ll recognize, later. We’ll call it “Welcome Email list” for this demo. Step 2. Create your Web Form. Ok, now we have to set up the web form that you’re going to use. If you already have one, great! Just click on “Webform” at the top right of the page, and then on “Edit” under the specific web form you want to play with. If you haven’t created a web form, yet, click on “Add things” at the top of any Mimi screen, and activate the “Web form” feature. Click on “Go set it up”, and then on the orange “Add a Webform” button. 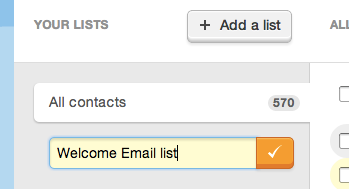 Click on the “Add a list” dropdown on the right, and choose your new “Welcome Email list”. 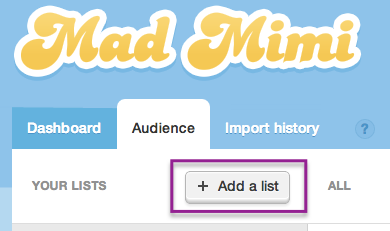 Mimi will automatically save this change, and you can see that the list has been added right there on the page. Pro tip: You can create a new list for your Audience, right here, using the “A New List” field, at the bottom of that dropdown. You will want to make sure to get this web form out to the world, so people can use it to sign up for your mailings! You can publish the form on your website, or just share the form URL, or connect it with your Facebook business page. We even have a special plugin for any WordPress sites that you want to add it to. Step 3. Create your Welcome Email Drip Campaign. Alright, now we have to create the actual Welcome Email Drip Campaign that will get sent out to your new subscriber. If you haven’t already, activate the Drip Campaign add-on feature, and click on “Go set it up”. If you have already activated it, just click on “Drips” at the top right of the page. Click on “New Drip Campaign” and specify the details asked on that page. In this case, I’ve called it “Welcome Email”. Make sure to select the new list that you connected to your web form, in the previous step. And, you also want to tick the checkbox that’s called “Send the first promotion immediately after a user signs up.” This way Mimi will always send the Welcome Email just as soon as the person signs up through your web form. This is the most exciting step! Now that you have your web form set up, connected to your new list, and your Drip Campaign is connected, designed and ready… all you have left to do is push the start button! You’ll see an orange “Start Campaign” button in the top right of the screen, or a “Run campaign” button underneath the Drip Campaign preview on the “Drips” landing page. Sit back, relax, and watch those new signups roll in. 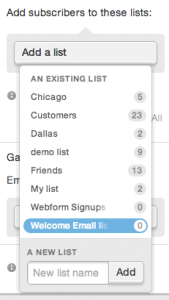 As soon as anyone signs up through your web form, that Welcome Email Drip Campaign will send to them, automatically. You don’t have to do a thing!